Why does JD open my browser? Browser loop is been used for ReCaptchaV1. Browser Loop approach opens a browser window or tab, and closes it a few seconds later without any user interaction required. The captcha will then be shown in JDownloader standard captcha dialog. Browser Loop can be avoided with setting up 'google.com (recapthca)' account in Settings > Account Manager. This account provides the required information in order to recieve biased ReCaptchaV1 image. You can disable Browser Loop in Settings >Advanced Options > BrowserCaptchaSolver: Browser Loop. Just be aware that if you disable Browser Loop and do not provide a google.com (recaptcha) in JD Account Manager, RecaptchaV1 images will harder to solve! 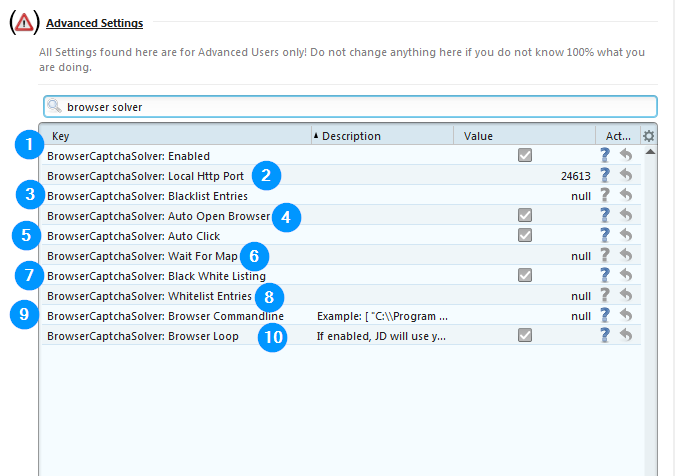 Browser Solver approach will show the captcha in browser tab or window. After solving, the browser window will close itself, and JD will continue. Blacklist Entries: Define which hoster/plugins shall not use the browser solver. Note: The format is a json array. * These special characters must be escaped: \ and " --> \ to \\ and " to \"
* Do not press enter to confirm changes. Just unfocus the field by clicking somewhere else. Auto Open Browser: Should JD open the browser for you, or do you prefer to click a button to open it? Auto Click: JD can help you to solve some captchas in the browser, by simulating clicks and text inputs in the browser window. Wait For Map: Is required for the solver priority. Note: The format is a json object. Black White Listing: Enable/Disable the Blacklist or Whitelist Entries. Whitelist Entries: Define which hoster/plugins shall ignore the Blacklist Entries the browser solver. Browser Commandline: We recommend to use the default browser that you use every day. This will guarantee the easiest captchas. If you want to use a different browser anyway, you can set up an command line here. The browser approach is pretty new and there are still some problems to solve. Please do not hesitate to contact our support. Go to the page "about:config"